myths about suicide, by Thomas Joiner. Publisher: Harvard University Press 2010. Hardcover. 304 pg. We need to get it in our heads that suicide is not easy, painless, cowardly, selfish, vengeful, self-masterful, or rash . . . that it is partly genetic and influenced by mental disorders, themselves often agonizing; and that it is preventable . . . and treatable. Joiner’s father committed suicide which infuses his academic research with additional empathy and relevance. He states that people die from suicide because they possess both the ability and the desire. In additional, a suicidal person feels both perceived burdensomeness [view that one’s existence burdens family, friends, and society] and a sense of low belongingness [perception that one does not belong—the feeling that one is alienated from others and not an integral part of a family, circle of friends, or other valued group]. 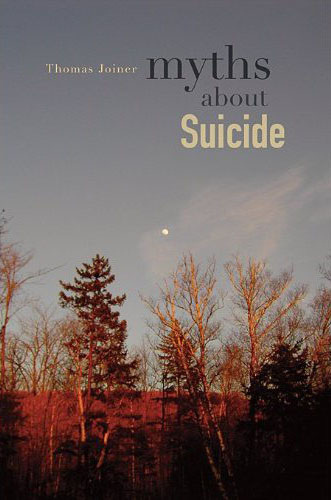 The finely articulated points in Myths About Suicide make this book an excellent resource about a highly stigmatized topic. Myth: suicide is an easy escape. –successful methods of death by suicide include jumping, drowning, decapitation, hanging, stabbing and shooting in back of the head. None of these are easy to do. –American Association of Suicidology mnemonic for suicide warning signs—IS PATH WARM? –going back to the burden theory, the person committing suicide thinks that in doing so will relieve others if she is no longer around. –“People who die by suicide do, I believe, undergo a kind of mental break involving their views of death—they come to see death as a comfort to others and to themselves—but this mental break is not the same thing as psychosis, intoxication, dementia, or delirium. The best evidence to date indicates that around 95 percent of those who die by suicide have a diagnosable mental disorder at the time of their death. –Kurt Cobain’s lyrics told his unhappiness. He also left a note. –Sylvia Plath wrote many poems which expressed her depression. She did not leave a note. –Joiner suggests that mental health isn’t taken seriously and follow-up and diagnosis is poor. This entry was posted on January 23, 2011, 05:23 and is filed under Books. You can follow any responses to this entry through RSS 2.0. Both comments and pings are currently closed.